I am a frequent reader of your blog...I am in Montreal, a city covered with snow for a good part of the year (over a hundred inches this last winter) and where a lot of people commute by bike year round. The numbers for sure are not as high as Portland, mostly because of the often inclement weather and partly because we lack efficient cycling facilities. Still, for the entire city, cyclists accounted for 1.6% of commutes in 2005. In certain neighbourhoods, such as Plateau Mont-Royal, it is 6.5%. (http://www.veloquebec.info, page 5). 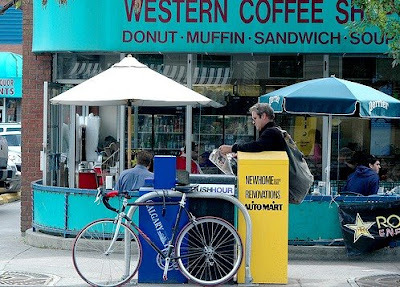 When you write "most bicycle-friendly city in North America", I feel we are left out. The ranking you refer to was established by the US census bureau and solely for the US territory. Of course Canadian cities such as Victoria, Vancouver, Ottawa and Montreal were not considered. But…aren’t they in North America? Best regards and Bonne Route! As a New England native and avid francophile, I love Montréal. I certainly have never intended any slight toward les cyclistes Québécois. Prompted by this thawing correspondent from Québec, I decided to look into the bicycling culture of Montréal, which appears to be very healthy indeed. Last May, city hall released plans to transform Montreal into a cycling haven on par with Paris or Lyon, envisioning a not-too-distant future of 400 new kilometres of new bike paths, a self-service bicycle rental system and five times as many bike parking places. The $134-million plan has since gone through 10 public and 10 agglomeration council consultations, and in a few weeks the city will announce how year one will shape up. Vélo Québec, a non-profit cycling lobby group...called it "ambitious." The transport plan is available on the city’s Web site as part of the Reinvent Montreal guide. 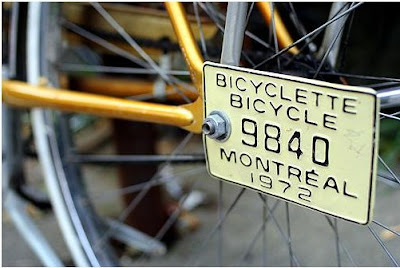 Like any other hip dynamic city in the 21st century, Montréal also boasts a lively fixed-gear bicycle renaissance, again according to the Mirror. Fixie fans in la Belle Ville even have a website and message board. Many of these fixie riders may be pedaling over to the first ever Artistic Bicycle Exposition. With more than 2,400 miles of bike trails, Québec boasts the largest cycling network in the Americas, the famed Route verte. Inaugurated last August, the Route verte was recently named the top cycling route in the world by the National Geographic Society. It's been nearly 20 years since I last visited Montréal (having moved to California in 1991.) I look forward to another visit for a first-hand look at the city's bicycling progress. Maybe it is eye-popping gas prices or that flab around your middle that has you thinking about dusting off the old 10-speed in the garage. In either case, Omaha's first bike route map is intended to help you get where you need to go. 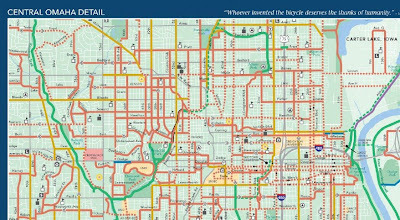 Bike route maps are very useful tools for new and experienced bike commuters in any community. This Omaha map sounds very encouraging for a city not known for bike commuting. There are also promising developments with online bike route maps, such as Bikely and the petition drive to persuade Google Maps to include bicycling at GoogleMapsBikeThere.org. AMY GOODMAN: For many, Portland is a haven of green-friendly urban planning. It recently topped Popular Science’s list of the greenest cities in the United States. A big part of that is bikes. Portland is widely considered the most bicycle-friendly city in North America, so much so that bikes are on display throughout the Portland airport. Worldwide, it’s seen as only second to Amsterdam. I’m joined now by two local transportation activists. Elly Blue is the coordinator of the Towards Carfree Cities conference taking place in Portland this June. She is also a contributing writer to bikeportland.org. Scott Bricker is also with us, executive director of the Bicycle Transportation Alliance, or BTA, a nonprofit membership group working to promote bicycling and improve bicycling conditions in Oregon and Southwest Washington. Welcome to Democracy Now! Talk about how Portland is so bike-friendly. What does it do? 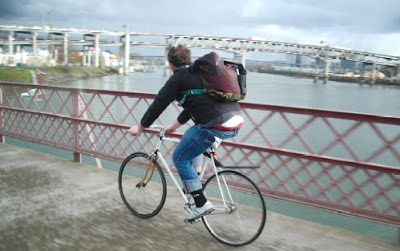 SCOTT BRICKER: Portland has a history of being bicycle-friendly, and it actually—it really goes back to Oregon in the 1970s, when they passed a bicycle bill, which required that all new bicycle—all facilities would be built with bicycle and pedestrian accommodations. And in the ’90s, Earl Blumenauer, who was a city councilor at the time, is now a congressman, worked to get a bicycle program that at the time had four staff members, and they worked to just get bicycle facilities on the streets. Amy Goodman is the best journalist in the U.S., and I am a big fan of Democracy Now!. Goodman broadcast from Portland last week, and her crew couldn't help but notice the city's bicycling reputation. The program features an excerpt of a video by the talented folks at StreetFilms.org. Gone are the days when cycling advocates bickered about whether bike lanes actually improve safety for cyclists. Studies prove that bike lanes and other markings boost bicycle use, reduce vehicular traffic and speeding, and in many cases, decrease car-bike collisions. "A handful of people are opposed to bike lanes on a philosophical or practical basis," wrote Chris Porter, chair of the MassBike Metro Boston chapter, in an e-mail. Many of this minority are holdovers from the days when "vehicular bicycling" thinking --folding bikes into the regular flow of traffic with no special accommodations--held sway. MassBike and other major bike advocacy groups support bike lanes, as long as they are designed properly. But bike lanes aren't the only option. Roads often need to go on "diets" to either remove or narrow a lane of traffic or parking to make a little room for bikes. This is what happened on Mass Ave in Central Square, said Cara Seiderman, transportation program manager for Cambridge. Eleven feet is a generally accepted minimum width for a busy urban travel lane such as on Mass. Ave., said Seiderman. Cambridge has found that even 10-foot lanes, like on Hampshire Street, are as safe as wider lanes. One reason: they slow traffic. Most engineers design at least five-foot-wide bike lanes, but not every advocate agrees about appropriate widths. Some believe that even standard widths "encourage bikes to ride too close to parked cars," said Porter. In other words, raising the threat of getting "doored." 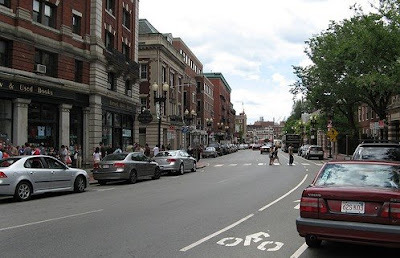 But a 2003 study by the city of Cambridge found that bike lanes and pavement markings actually encouraged bicyclists to travel further from, not closer to, parked cars, compared with their behavior when no markings were present. Motorists also cited bike lanes as a big reason why they noticed bicyclists. I've written in the past about the welcome demise of vehicular cycling (VC) among bicycle advocates. As a practical approach to individual cycling, VC makes great sense: "drive" your bicycle as if it were a vehicle, claim your space, signal your turns, ride with traffic. However, as a basis for bicycling advocacy, VC is negative, pessimistic, and counter-productive. Essentially, VC proponents conceded bicycling's marginality and didn't believe the roads could be changed to better accommodate cyclists. Instead they encouraged bicyclists to accept their minority status and adapt to roads designed for high speed vehicle traffic. In contrast to this nonsense, the success of "complete streets" advocacy in cities such as San Francisco, Portland, New York, and Chicago has clearly demonstrated the effectiveness of infrastructural enhancement. These cities all have strong bicycling advocacy organizations, which have successfully pushed for enhanced bicycling infrastructure, such as bike lanes, "sharrows," signage, bike paths, and secure parking. Friendlier streets have led to more bicyclists, which in turn has increased safety as motorist awareness improves. And now Boston is finally moving to improve the streetscape to better serve bicyclists and other non-motorized travelers. I couldn't agree more with this new Boston Globe columnist: Bike lanes work. 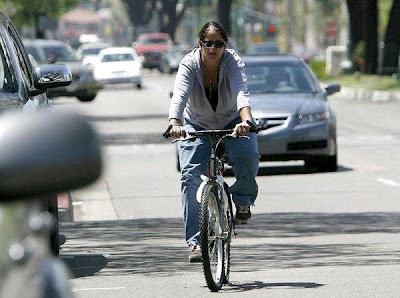 Aiming to encourage more people to ride bicycles to work and school, city officials and a consultant have nearly completed a plan to triple the number of bike lanes in Escondido. Studies indicate that roughly 3,500 of the city's 144,000 residents would ride their bikes to work or school if the city implements all the projects in the plan. The plan recommends expanding the city's bike lanes from 33 miles to 106 miles. City officials estimate that fewer than 2,000 residents use bicycles to commute. While Escondido has grown significantly in the past 15 years, its bicycling infrastructure hasn't. Pushed by the advocates in the San Diego County Bicycle Coalition, the San Diego county community is finally moving to better serve cyclists. "Lisa", Newington, CT: what a freakin joke! Now we got to pay millions so a couple cyclist can peddle to work? get some brains! stop paying $100 a month for cable tv and buy some gas you dolts! "Bostonian", Boston, MA: Lisa-Thanks for putting it so bluntly. You are everything that is wrong with America. I couldn't resist sharing this, from the comments section of the Hartford Courant, responding to a generally favorable editorial, Watch That Cyclist, in support of a pro-bicycling bill in the Connecticut legislature. 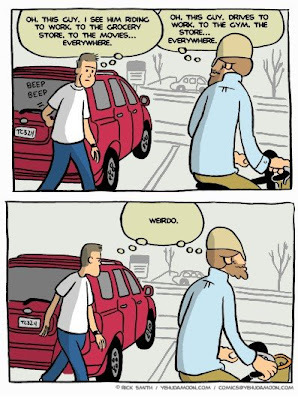 "If bike commuting were safer, more people would try it. They'd get exercise, save fuel and cause less pollution — which all should be encouraged." However, the Courant editorialists stop short of fully embracing the bill's Complete Streets provisions. The Connecticut legislation is similar to the AB 60 Safe Passing Distance bill introduced last year in California, which failed in committee. The Connecticut bill will require motorists to allow at least three feet when passing a bicyclist. It's a modest acknowledgment of bicyclists' rights to the road. However, I remain skeptical that legal provisions offer better security for bicyclists than improved road design. Give me Complete Streets anyday. Los Angeles Mayor Antonio Villaraigosa earlier this year urged city residents to take public transportation to work in a bid to fight soaring gas prices and reduce traffic congestion. Though I don't live in the city of L.A., I felt that if the mayor could get to work on public transit once in a while, so could I. Actually, I had been thinking about this ever since Redondo Beach completed its new bike route through the northern part of the city in December. That 2.8-mile path links the Metro Green Line station on Marine Avenue with 190th Street. As someone who lives close to the eastern end of the Green Line, I figured the combination of bike and light rail would offer a viable alternative to commuting to work by car. All told, it took about an hour and a half to complete the 21-mile commute. Normally, it takes about an hour to make the trip by car on busy weekday mornings. I figured I could shorten the 90-minute ride somewhat with additional conditioning. 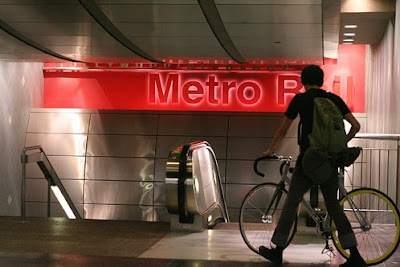 Personal account of a newspaper editor who attempts a "carbon-reduced commute" in Los Angeles, taking advantage of the region's recent expansions in transit service and bike path infrastructure. Biking to work is one of those activities that sounds great in theory, but putting it into practice requires a considerable leap of faith. On the plus side, bicycle commuting kills three birds with one stone: it integrates exercise into your daily routine, cuts down on pollution and saves you a ton of money in gas and parking fees. Bonus: With Calgary's ever-worsening rush hour, cycling can also potentially save you time. A lot of those questions are answered on user forums at bikecalgary.org, where about 400 cyclists share information and sound off about their concerns. The site acts as a virtual support group for cyclists, with tips for newbies, links to local bike shops and a guide to city pathways. "One of the purposes was to support new bicycle commuters," says (Stewart Midwinter, a member of cyclist advocacy group Bike Calgary), who started the site. He sees Bike Calgary as bridging the gap between events like Bike to Work Day and year-round behaviour by providing a support network and advocating for improved infrastructure. Comprehensive article from Calgary, which celebrated Bike to Work Day on April 11. The Alberta city appears to have an emerging bicycling advocacy movement, calling for more bike lanes, better transit access, bike racks. The hardest thing about biking to work might be getting up the nerve to try it. It could be easier than you think. 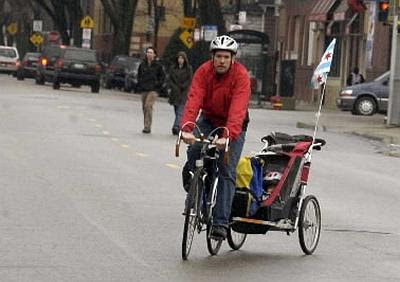 "There's a level of discomfort in riding in traffic for some people," said Melody Geraci of the Chicagoland Bicycle Federation. "It's just a matter of trying it once or twice and finding a level of confidence." Every morning, (Michael) Burton puts his 18-month-old son, Miguel Kilgore, into a bike trailer and takes him to day care. Then Burton rides to his job. In the afternoon, Burton's wife, Gin Kilgore, bikes from her job at Mitchell Elementary School in Ukrainian Village to pick up Miguel. They don't own a car, which helped them to save enough money to buy a three-flat. Inspirational article from Chicago, featuring encouraging comments from the Chicagoland Bicycle Federation, as well as several testimonials from local bike commuters. Very encouraging. Image: Chicago Sun-Times. Michael Burton heads to day care with his 18-month-old son in tow. Larry Patterson's feeling the pinch at the pump...but that's driven him to do something a little different with his transportation these days. What have you done differently? Patterson said, "A couple of things I've done differently, I started walking, the weather is nicer so I've started walking places close to me but if there's a distance then I try to get a bus pass." But on this particular day...Patterson was actually fueling up for a specific purpose. Patterson said, "I have considered getting a bike. I'm actually on my way now to look at prices for a bike." As it turns out that's becoming a popular thing to do these days. Greg Davis is a partner at Madison and Davis Bicycle shop in Quincy. Have you seen an influx in customers since gas prices started going up? Interesting video report on the growing appeal of bicycling. This "high gas prices moving people from four wheels to two" is increasingly popular as a news hook these days. Those of us who have been riding for years have always known bicycling is fun, healthy, effective. That message hardly got through. Now bicycling as affordable transportation is gaining traction. Greensboro: Mean streets for bicyclists? Theoretically, bicycling is supposed to be a healthy activity. And statistically, Greensboro, where the accident occurred, is supposed to be conducive to biking and walking -- relatively speaking, at least. But you have to wonder. The numbers don't factor in close calls and abuse. And they only include those accidents that are reported to police. Despite the spread of bike lanes (up to 14.5 miles now) throughout the city and such cyclist-friendly amenities as bike mounts on city buses, local drivers are not especially known for our willingness to share the road. We cuss at cyclists...We throw stuff at them...Sometimes we even kill them. Great column from North Carolina, reacting to a near-fatal collision involving a local bicyclist. If only more news outlets offered such intelligent writers. 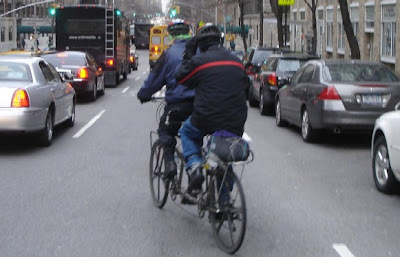 Will more punitive legislation improve bicyclist safety? Maybe. Just as capital punishment prevents murder...right? Personally, I prefer that advocacy demand better road design--Complete Streets--which reduces vehicle speeds and improves safety for all road users. The recent deaths of two bicyclists in Cupertino once again highlight the need for aggressive timetables for projects and educational programs that make Marin County roads safer for bicycle riders. 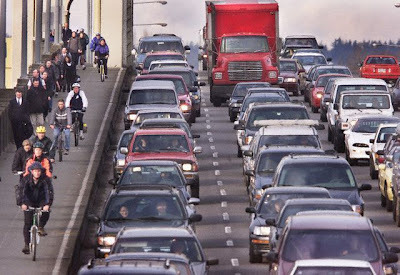 However, a positive piece of data from the California Highway Patrol's Statewide Integrated Traffic Records System (SWTRS) shows that Marin County bike and car crashes declined by 34% over the past 10 years, while bicycle commuting has simultaneously increased by 66%. The Marin County Bicycle Coalition's efforts continue to help make the road safer...Through our collaborative efforts with law enforcement and public works departments we have raised awareness and changed the physical environment to make our roads safer for bicycle riding. Each time we secure new bike lanes, Complete Streets policies, fiscal support for non-motorized transportation projects, etc. we are helping to make the roads safer for bicycle commuters and recreational riders in Marin County. Check out MCBC’s Share the Road page on our website for more information about bicycle education classes, safety tips for both bicyclists and motorists, and more. Bicyclists in California's Marin County are among the luckiest riders in the world: great weather, bike shops, bike facilities, reasonably bike friendly public transit (Golden Gate Transit ferries and buses), great bicycling community, and outstanding terrain--including my favorites Mt. Tamalpais, Marin Headlands, Point Reyes, and the rural roads in the western coastal part of the county. And bicyclists in Marin also have one of the most effective advocacy organizations in the country, the Marin County Bicycle Coalition (MCBC). Also, as a Bike Commute Tips Blog reader recently reported, the daily Marin Independent-Journal has had a bicycle columnist for five years, Christine "Peanut" Vardaros. The Boston Globe's new bike columnist is a relative newbie. Image: Marin County Bicycle Coalition. 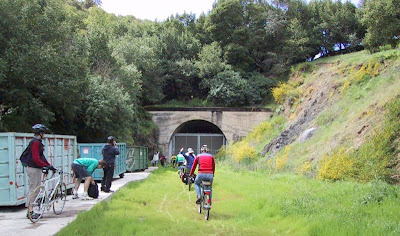 Abandoned CalPark railroad tunnel, future bicycling route. With a barrel of oil trading above $100 and fears that gasoline could hit $4 a gallon this summer, many Cape Codders are looking for ways to lessen the pinch on their wallets. For some, the solution may be found at your local bicycle shop. 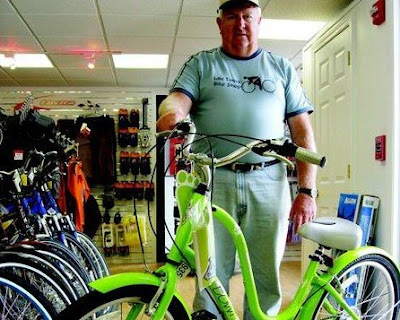 At Orleans Cycle on Main Street, manager Doug Jordan has noticed an increase in the number of people coming into the store who are interested in purchasing a bike for commuting to help cut down on driving and paying for gas. Another article demonstrating the breadth of the high-gas-prices-drive-bicycling theme. This theme recently inspired a new State Farm Insurance commerical, which has provoked much discussion on bike listserves and was intelligently deconstructed by StreetsBlog. More than 100 years (after the first popular wave of bicycling), the bike is again going to step up onto the podium of popular choice as fuel costs, automobile prices, rising insurance and pollution curb this driving nation. Bike designers seem to have been anticipating the demand with designs that are efficient, comfortable and durable, as well as being eye-appealing. One of the most common inquiries I get from visitors to my bike commuting tips site is: "What bike should I get?" And the response I usually make is just what the reporter on this story did: visit a trusted local bike shop and consult with the staff. Selecting the right bike is very subjective. The experienced staff at a bike shop can advise prospective bicyclists on the most appropriate ride, after consulting on the buyer's needs, tastes, budget, abilities, and expected travel distance.